New York (TADIAS) – This past July the University of Gondar, which is celebrating the 60th anniversary of its founding this year, “re-graduated” about 500 alumni along with over 4000 students. The alumni had gathered for the three-day occasion (July 5-7th, 2014) from across Ethiopia as well as from other African nations, the United States, and Europe. The University’s Alumni Steering Committee in the U.S. estimates that there were about 100 former graduates in attendance from the Diaspora. The University of Gondar is the first public health institution in Ethiopia, and was established in 1954 as a Public Health College in response to a malaria epidemic to help train nurses, health officers, sanitarians, laboratory technicians and other professionals that would eventually form the backbone of the country’s modern public health structure. It was transformed into a medical college in 1978 and a full university in 2004. The Alumni Steering Committee in the U.S. includes six graduates of the historic Ethiopian institution: In addition to Dr. Elias, they are Dr. Anteneh Habte (1984), Founding Member, Clinical Assistant Professor at West Virginia University School of Medicine; Dr. Mulugeta Zerabruk Fissha (1998), Founding Member, Director of Cardiovascular Services at Newman Regional Health, Emporia, Kansas; Dr. Nuru Abseno Robi (1988), Consultant in Obstetrics and Gynecology at the Department of Obstetrics and Gynecology at Providence Hospital in Washington, D.C.; Dr Yared Aytaged Gebreyesus (1988), Consultant in Internal Medicine at the Blue Nile Clinic in Alexandria, Viginia; and Dr Yared Wondimkun Endailalu (1986), Consultant in Internal Medicine at the Mary Washington Health Group in Fredericksburg, Virginia. Dr. Elias shared his opinion that in general alumni and their potential resources are not effectively utilized in Ethiopia, and it was with this in mind that the University of Gondar Alumni Steering Committee in the US was established. “In close collaboration with the University of Gondar senior leadership, and with its president Professor Mengesha Admassu in particular, the Gondar Alumni Steering Committee worked hard in various areas to set an example so that other Ethiopian Universities will give the necessary attention to alumni activities and strengthen their alumni offices with appropriate manpower and resources” he said. Dr. Yared likewise added that based on the feedback received so far, the effort of the steering committee has paid off and the University of Gondar is being seen in Ethiopia as a “pioneer” in effectively collaborating with its alumni. Both Dr. Elias and Dr. Yared also thanked the leadership of the University of Gondar for believing in the power of alumni and for supporting all the activities of the steering committee. 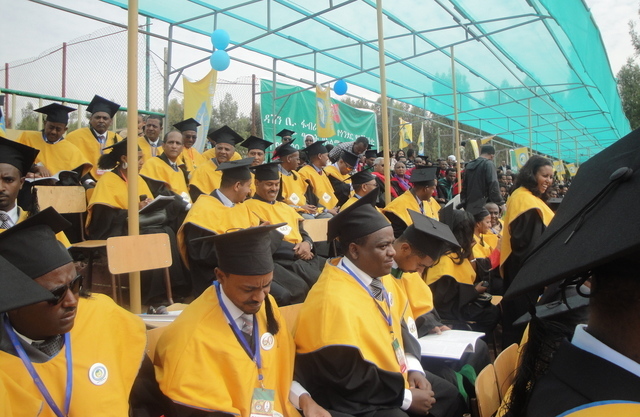 For more coverage on Gondar University and its journey to its 60th anniversary, you may listen to People To People’s broadcast on blogtalkradio.com. More information on The Alumni Voice can be found at: Facebook.com/University-of-Gondar-Alumni-Journal-special-edition.